Thank you, Alma…I don’t know why I didn’t see this until a year later, but thank you for your patience. 🙂 You continue to be a huge blessing in my life! I can’t imagine the ache a mother feels watching her child lose the laughter. I’m choked up just reading this. May God grant you both joy and peace . Thank you, Valerie, for such sweet comments. It helps me to know it touched you deeply. We are in a better place right now, but we know God walks with us when we’re not. Can’t imagine life without Him. Blessings! Thank you, bekalynn02! I really appreciate you coming over from #WordsWithWinter! I pray He is indeed glorified in all of my words and sharing. Blessings to you! I love how you talk about tools that keep him strong, Tabitha! What a beautiful way to put it! Thanks so much for coming by! Blessings to you! Praise the Lord! What a blessing to hear his laughter again and see him planning for the future! Our Lord is mighty and wonderful and am so thankful for His faithfulness to your family and the hope and joy he gives you as you hold onto Him! Thank you so much, Kristi! What you wrote is so precious! I agree…He is mighty and wonderful! Blessings to you and yours! What a wonderful post, Bonnie. Hope is something that I’ve been thinking a lot about lately, and your words help make this difficult and broad concept take form in my mind and heart. 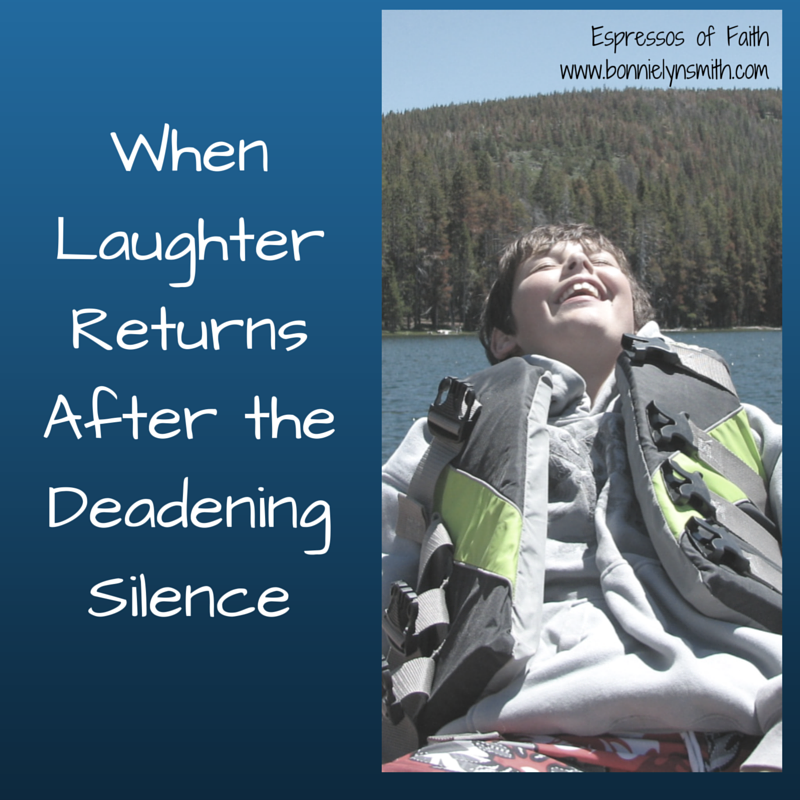 I love how you said that God was building laughter within your son during the difficult times. What a great description of how he works in us to build that which we have lost or need. Thanks, Andrea! So glad to see you pop by! Ironically, this post was written 9/30 last year, and yet, here we are again, ebb and flow. Little Man has maintained better in the past year. The lows weren’t as low. I’m very grateful. Much love! Oh the hope that in those seasons of silence, God is truly at work building His Purpose in our circumstances! Above all, your words remind me that God is ever present through it all. We must trust that, even when we *feel* He isn’t. This reveals such a withstanding ever-present hope. Our strength in clinging to God’s Promise surely sustains us in the hardest parts and pieces of our lives —> “No matter the result”. I am rejoicing with you in the light of your mama heart after the slow aching silence! And I will continue to pray for more laughter, more joy to rise in that precious boy’s heart! Chrissy…love that you’re here! I agree….our feelings mislead us! No matter the result indeed! Thank you for your prayers. I believe there is a beautiful plan for Little Man, borne of much hardship, trial, and storms. I am with you in this.I feel your heart. From one Mama to another of a child with mental health struggles. The grief, the joy, the faith. It is part of our day to day and moment to moment. I’m so glad I found your pinterest pin through Rosilind’s Facebook community! Hi, Lori….you don’t know how much it strengthened me to get your comment and feel less alone from one Mama to another who understands this. Blessings to you! I really appreciate your coming by and leaving a comment! There is NOTHING like a child’s laughter! Give Little Man a BIG hug from me & save one for yourself! Beautiful post! I absolutely loved this post – not just for its gorgeous, vivid writing, but most especially for the hope and laughter you have in your house again. Thank you, Jennie! This really encourages me on so many levels! Blessings to you! Love this. Beautifully written. I can relate to the not being able to find your joy. I love the line of the there is a lion/ness within us with an incredible growl! Happy to hear that smiles are returning! Praise God! Praise God indeed! Thank you, Tasia, for sharing a piece of your heart with me! I hope you are finding joy more now. Blessings! Thanks for coming by!